Online learning, a new concept that has emerged in the world of education as a byproduct of the widespread insertion of internet penetration globally, is burgeoning by leaps and bounds throughout the world. A report by the Babson Survey Research Group (2013) reveals that over 6.7 million post secondary students enrolled themselves in at least one online course in comparison to just 1.6 million in 2002. As higher education institutions continue to improve and enhance the quality of their online curriculum, the student engagement towards online education is also witnessing rapid growth. On the basis of continuous increase in the number of students pursing online education, a large pool of prestigious colleges and universities have also started fully online degree programs and majority of these institutions award degrees to numerous students across the world through distance education. The mushrooming demand by students is the primary factor contributing to the progression of online learning. The flexibility of scheduling and cost efficiency that online studies offer, is a great opportunity for students who opt for online education. Potential benefits of online learning. Through online learning students may be able to save tons of money by not having to physically attend the course. Since online learning cuts down or eliminates the cost of transportation and other expenses being incurred attending classes in a conventional manner, students have the leverage to save their money for future needs. Students who pursue online degree programs or online courses, usually opt for purchasing physical or e-books through online book stores. In Asian countries online market places and online book stores such as Kaymu , Amazon and many others offer a wide selection of hard to find text books online. Such e-commerce websites provide students an opportunity to buy books online at the most affordable prices. Student who are engaged in online education programs find the option of purchasing books online as a time efficient and money saving option. Students have the opportunity to access their courses any time of the day or night. For working students on the move, online education is an excellent opportunity to attend their classes anywhere and anytime without compromising on their work schedule. Online courses can be easily accessible for students whenever required. Students have the option to review lectures, explanations, discussions, presentations and comments. Distance education provides the students the option to choose from a wider range of degree programs that might not be offered in the nearby bricks and mortar institutes. One of the advantages of online learning is that students can fix their study schedule according to their ease and feasibility. They do not have to sit through the very long lectures and can easily take breaks. Lectures can be paused and notes can be made when needed. 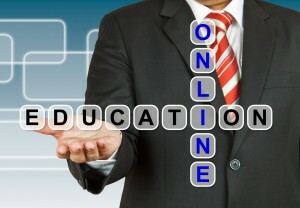 Online education has come a long way since its advent, and will witness more advancements in the coming years. Though this study methodology has a few limitations such as lack of proper surveillance to control plagiarism, but advocates are hopeful of taking full control of the shortcoming of e-learning in the coming years and expanding its horizon. The latest technological advancements provide a promising platform for online learning making education more accessible.